Trade is shaping up as a major issue on the 2015 legislative agenda, with Congress potentially voting on both expedited presidential trade negotiating authority and a yet-to-be concluded Trans-Pacific Partnership (TPP), a U.S. trade and investment agreement with nations bordering the Pacific Ocean. Congressional leaders and Obama administration officials have touted both these initiatives as opportunities for bipartisan cooperation after years of partisan political gridlock in Washington. Indeed, a Pew Research Center survey suggests such bipartisan efforts could find public support. Despite conventional wisdom in Washington that Republicans are free traders and Democrats are protectionists, there is no partisan divide on trade outside the Washington Beltway. 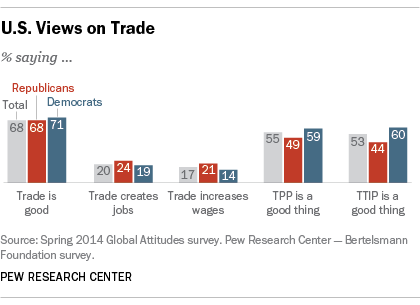 Both Republicans and Democrats voice the view that trade is good for the United States. But that won’t necessarily make passage of either trade initiative a slam dunk. Both the GOP and Democrats also agree that trade may not be good for them personally. About two-thirds (68%) of Americans say that growing trade and business ties between the U.S. and other nations are good for the country. This includes 71% of Democrats and 68% of Republicans. However, only one-in-five Americans think trade with other countries creates jobs. This includes 24% of Republicans and just 19% of Democrats. Similarly, only 17% of the general public says trade leads to higher wages, among these are 21% of the GOP and 14% of Democrats. Moreover, there is a discernible partisan split in support for specific trade agreements now under negotiation. According to another Pew Research poll, more than half the American public thinks both TPP and the Transatlantic Trade and Investment Partnership (TTIP), an Obama administration trade and investment initiative with the European Union, would be good for the country. But Democrats and Republicans disagree on their merits. Just 49% of Republicans back TPP and only 44% support TTIP. Democrats are more supportive of both TTIP (60%) and TPP (59%).